Spicy, with a mouthwatering balance of savory and sweet, Thai Basil Chicken is a quick stir-fry that will fill your kitchen with the hunger-inducing aromas of caramelized garlic and holy basil. Piled high on a plate of jasmine rice with a fried egg on top, and you have yourself a plate of perfection. Pad Kraprow Gai (ผัดกระเพราไก่) literally translates to Fried Holy Basil Chicken and is a Thai street food dish that also happens to be one of my favorite dishes of all time. While there are countless reasons to love this dish, perhaps the most compelling is its incredibly good effort to taste ratio. Ten minutes is all it takes to pull this dish off, and for your pittance of effort, you’ll be rewarded with a soul-satisfyingly delicious meal that’s cheap to boot. As the name implies, one of the primary components of this dish is basil. Holy Basil can be difficult to find outside of South East Asia, so many Thai restaurants in the US use Thai Basil (Ocimum basilicum var. Thyrsiflora), which is known as Horapha in Thailand. I’ve even seen some that use ordinary Sweet Basil (Ocimum basilicum var. Genovese). 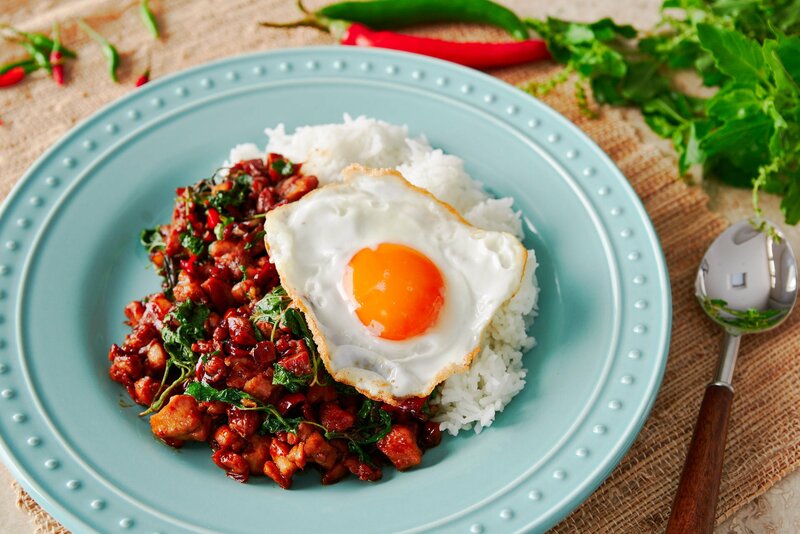 While these make for interesting takes on the original, it’s misleading to call these dishes Pad Kraprow Gai, as “Kraprow” is the Thai word for Holy Basil. Holy Basil (Ocimum tenuiflorum), is a member of an entirely different species of basil and has a distinct aroma with hints of cinnamon, cloves, and menthol. This gives it a flavor that’s closer to perilla or mint than most other varieties of basil which tend to have anise and licorice notes. It lends a beautiful freshness to the dish, contrasting the spicy chilies, pungent garlic, and savory-sweet chicken. If you’re lucky enough to live near a Thai grocery store, you should be able to find it there (I’ve seen it in stores in New York and California). Otherwise, if you end up using Thai Basil, just call the dish Pad Horapha Gai, and you’re all good. I like to use skin-on chicken thighs for making this dish, but skin-on breasts will work too. Since breast meat cooks much faster and gets unpleasantly dry when overcooked, you’ll want to add the sauce a bit earlier if you go with white meat. If you’re not a big fan of chicken skin, don’t worry, it’s going to get used, but not in the way you think. Keep reading for the details. I went to my local Thai market to pick us some Holy Basil, and they had a selection of a few chili peppers. I picked up some Prik Jinda and Prik Kee Noo Suan. Prik Jinda is a larger chili pepper about the length of my hand, and it comes in a variety of colors depending on how ripe it was when it was picked. It’s fairly spicy, but not as spicy as Bird’s Eye Chilies (which rate 50k to 100k on the Scoville scale). I’d say they’re on par with Serrano Chilies in terms of spiciness. Prik Kee Noo Suan literally means “mouse dropping chilies,” presumably due to their shape and size. Despite their compact form factor, these suckers pack a punch. I popped one in my mouth, and as soon as I bit down, my nostrils started to burn, and my eyes started to water. They’re spicier than Bird’s Eye Chilies, and my guess is that they’re up around Habaneros in the heat index. While I could have used a small amount of the Prik Kee Noo Suan, I decided to use a whole ripe Prik Jinda chili because I wanted the right balance between chili pepper flavor and heat. If you can’t find these chilies near you, you can use any pepper that fits within your tolerance for heat. 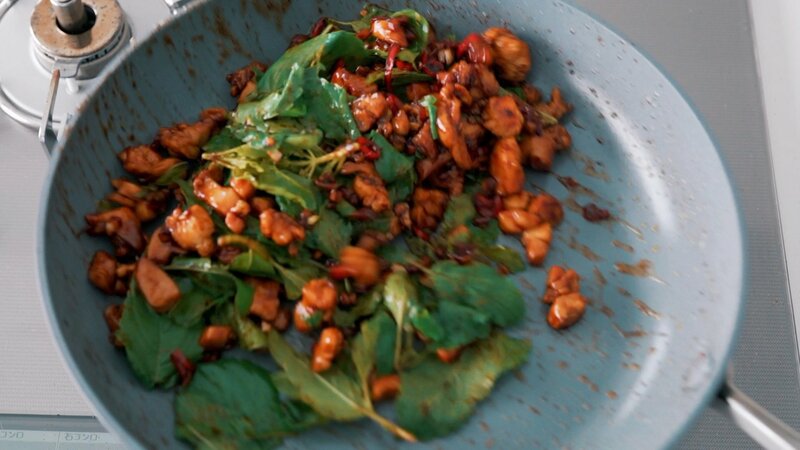 Basil chicken is typically seasoned with a combination of Thai dark soy sauce and oyster sauce. It should be noted that Thai dark soy sauce is quite different from Japanese or Korean dark soy sauce. It’s thick, syrupy and almost black in color, with molasses and caramel notes (though it’s not sweet). If you can’t find it, Indonesian Kecap Manis will work as well, but you’ll want to skip the sugar as it’s already quite sweet. 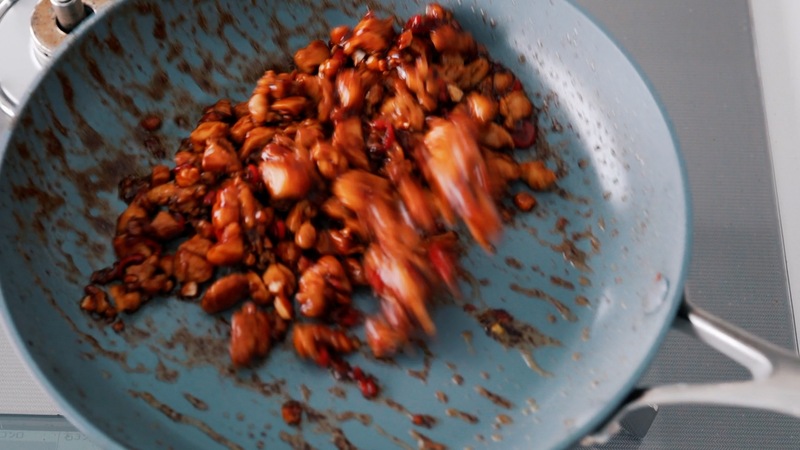 As for the oyster sauce, this adds a wallop of umami to the dish, and in a pinch, you can substitute it for the dark soy sauce as well, leaving out the sugar. Unfortunately, many oyster sauces I see are loaded with MSG and have little to no actual oysters in them, so be sure to read the ingredient label before buying one. I’m particularly fond of the Thai brand Megachef. Despite the corny name, their products, including their fish sauce is very good, and free of unnecessary additives. A high smoke point vegetable oil will work fine for this stir-fry, but I’m always looking for ways to reduce waste in the kitchen. That’s one of the reasons why I like to render the fat out of the chicken skin, and use that to fry the Basil Chicken. But this isn’t the main reason you should be doing this. Chicken fat (a.k.a. schmaltz) is the butter of the poultry world, and it’s loaded with flavor! Best of all, for those of you that don’t like the texture of chicken skin, by rendering the fat out, it ends up disappearing into the stir-fry leaving nothing behind but flavor. 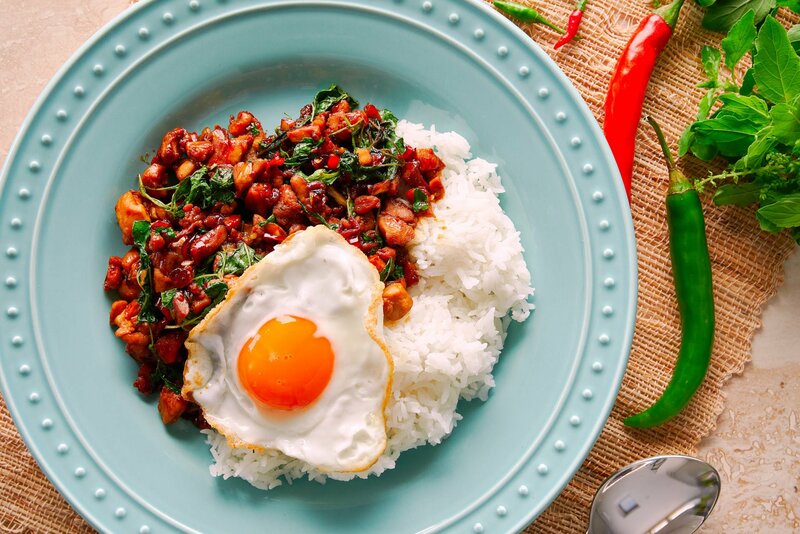 Although basil chicken is abundantly tasty on its own, the fried egg on top is what elevates this dish to an entirely new plane. The egg is shallow-fried, giving it a crisp golden brown crust on the bottom, while the molten yolk remains soft and creamy, adding a velvety richness to this humble weeknight meal. For some crazy reason, many Thai restaurants in the US don’t top their basil chicken with an egg, so I was introduced to this concept at a night market on my first trip to Thailand. Now that I know how good this is, I can’t go back. 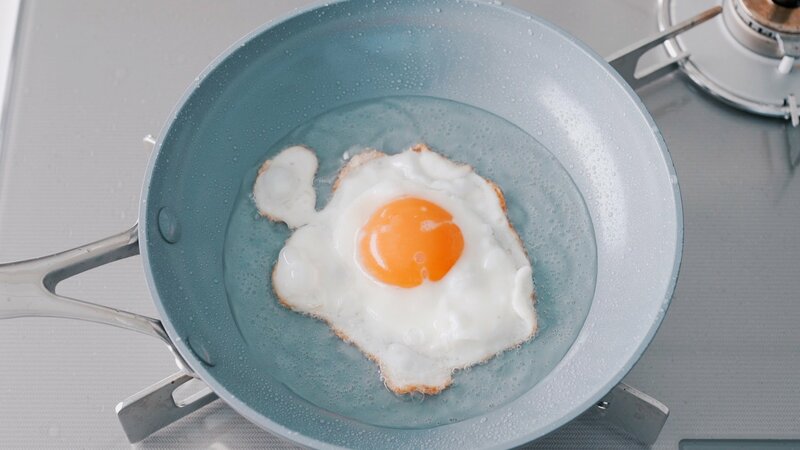 One word of caution, when you add the egg to the pan, you’re essentially dumping a liquid into hot oil, and it’s going to splatter and make scary noises, so please be careful. This dish is not complicated to prepare, but like most stir-fries, the cooking happens rapidly. That’s why it’s super important to have all your ingredients prepped and ready to go into the pan when needed. 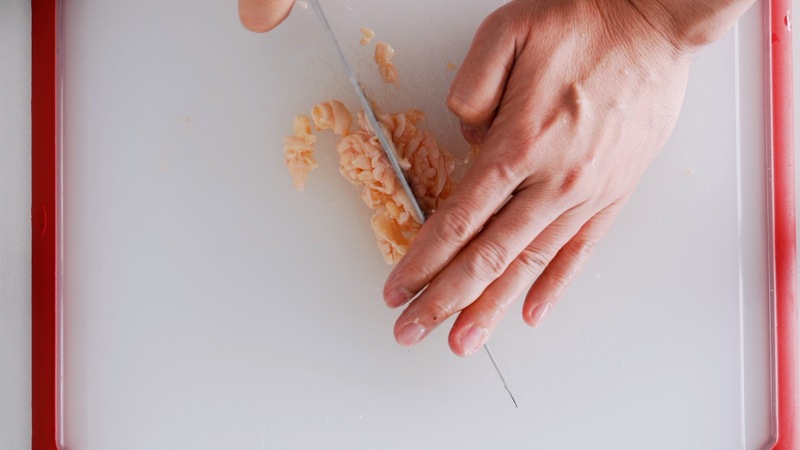 Once all your measuring, stirring and chopping are done, you start by rendering out the fat from the skin. When the skin is crisp, you should have a good amount of fat in the pan that you can use to saute the garlic and chilies. The minced chicken goes into this and gets stir-fried. When the chicken is almost cooked through, the sauce goes in and gets tossed until it turns into a thick glaze that coats everything in a shiny lacquer. Finally, a fistful of holy basil gets tossed in until it’s just covered with the sauce. It’s okay if it still looks a bit raw as the residual heat will finish cooking the delicate herb on the way to the table. 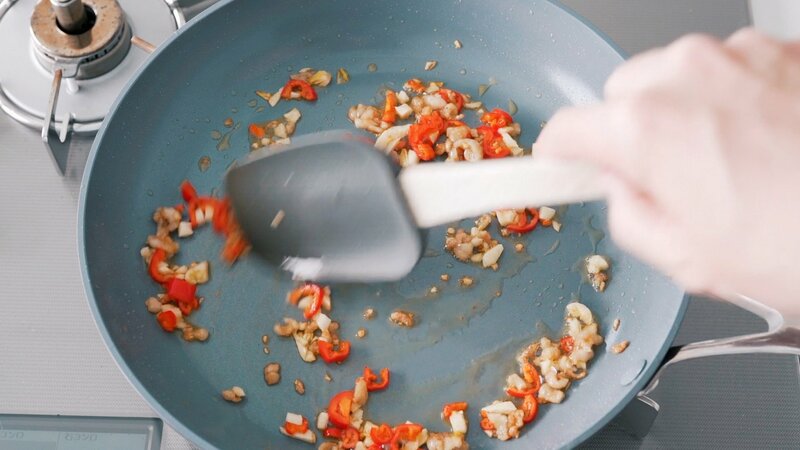 Timing the egg and the chicken so that they finish simultaneously is a bit tricky, so if you’re worried about juggling two pans at the same time, you can make the egg before the chicken and set it on a plate while you prepare the chicken. 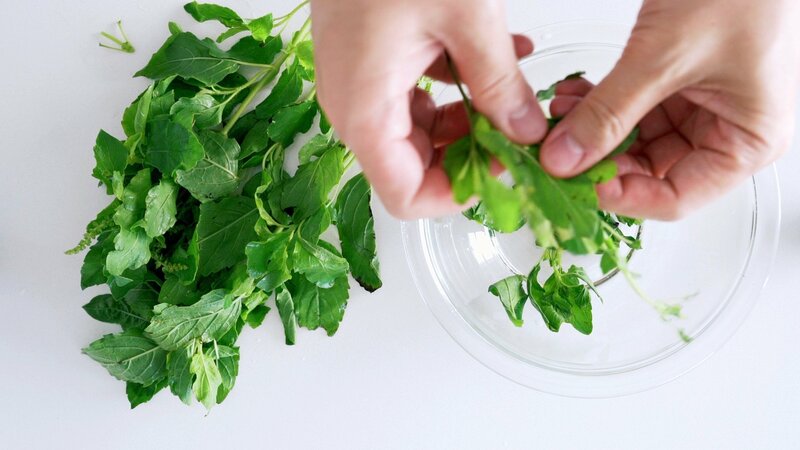 Pick the basil leaves from the stems and discard the stems. 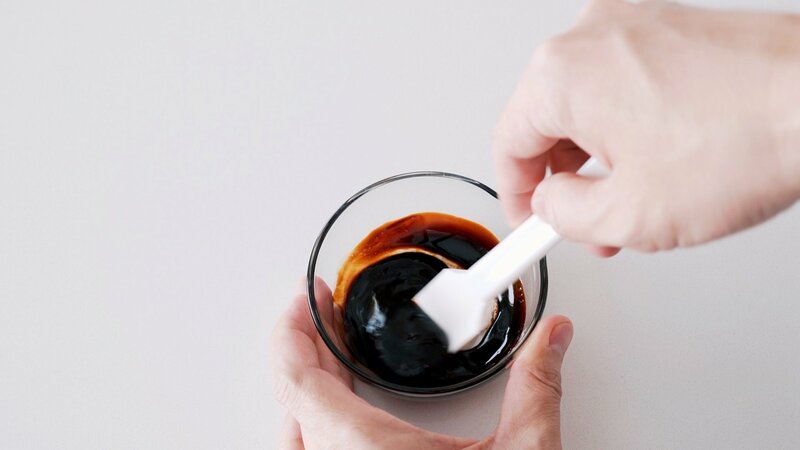 Measure out the oyster sauce, dark soy sauce, and sugar into a small bowl and stir together to combine. 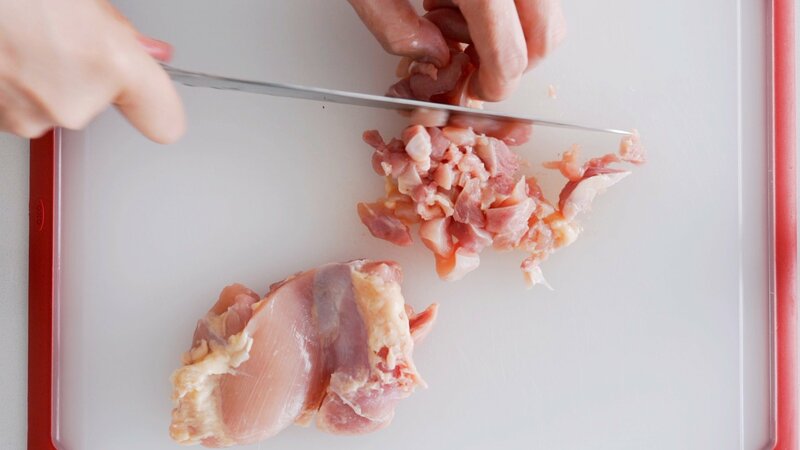 Remove the skin and fat from the thighs and slice the meat in one direction and then turn your knife 90 degrees and slice the chicken in the other direction to get pieces of chicken that are about 1/3-inch in size. Repeat with the skin, mincing it as finely as possible. Prepare two frying pans (one for the egg and one for the chicken). Put the chicken skin and fat into one pan and 2 tablespoons of vegetable oil into the other. For the pan with the chicken skin, turn the heat onto medium-low and slowly render out the fat, stirring from time to time to prevent burning. When the chicken skin is browned and starting to crisp, turn up the heat to high and then add the garlic and chili peppers and saute until fragrant (about 30 seconds). Meanwhile, turn the second burner onto medium-high heat and heat until the oil is shimmering and hot. 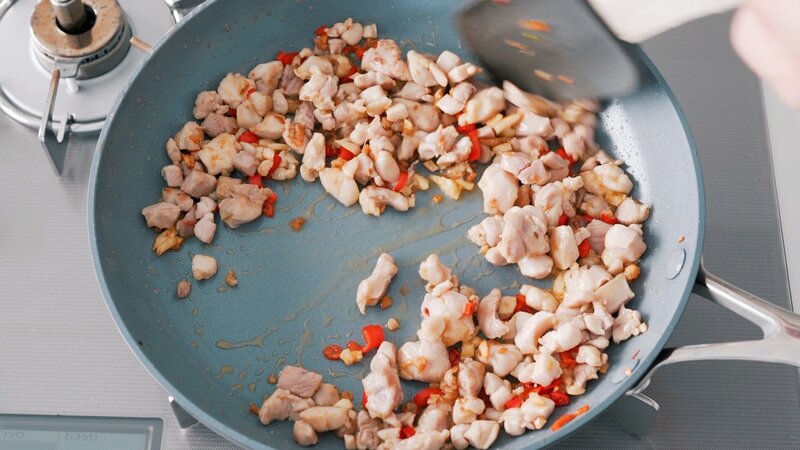 Add the chicken to the first pan with the garlic and chili peppers and stir-fry until the chicken is cooked through. 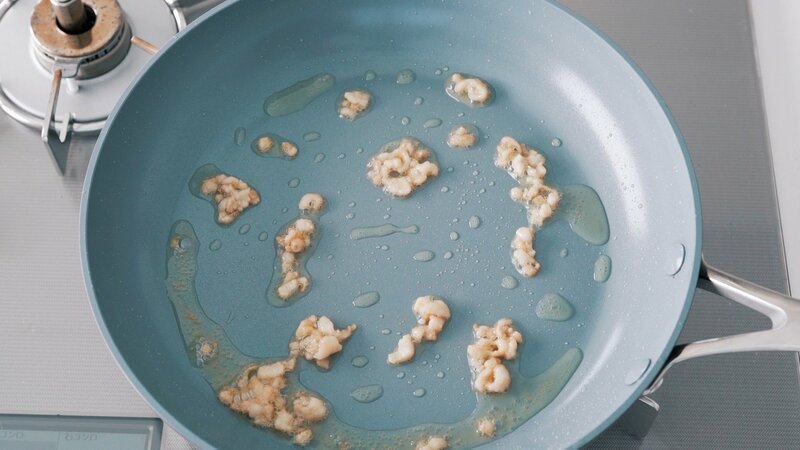 Carefully break an egg into the second pan and fry it until it's crisp on the bottom and the white is cooked through. When the chicken is mostly cooked through, add the sauce and continue tossing and stir-frying until the sauce coats the chicken evenly. Turn off the heat and toss the holy basil together with the chicken and plate immediately. 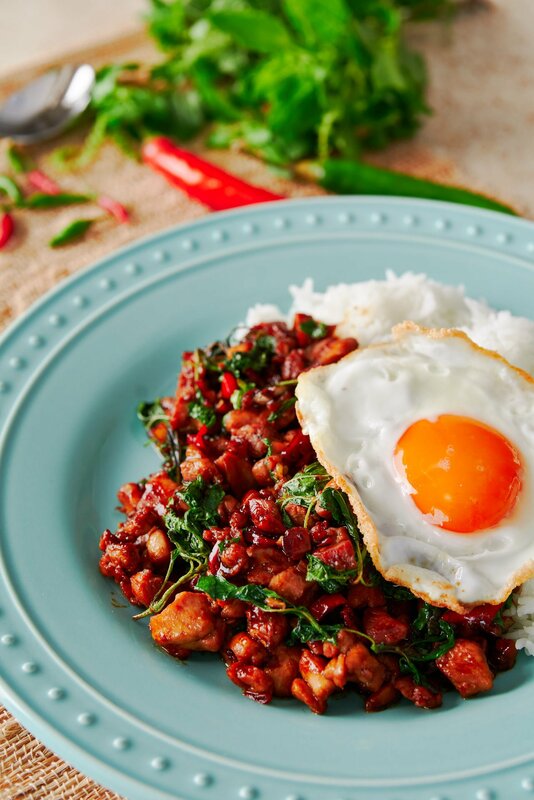 Top your Pad Kraprow Gai with the fried egg. This reminds me of the outstanding and very basil-y chicken dish I get at my favorite Thai restaurant. So delicious! This dish is one of my staples when eating out! I must admit it does look quite easy to prepare at home. I love the flavour of Thai basil…pungent and spicy! I had the same thing last night for dinner! The addition of the egg is gorgeous. I tried this tonight, it was simply incredible (and easy!) And you are so right about the egg, it really adds a rich luxury to the dish. Thanks for the great approach. I have not heard of basil yet.I do not know what it is? Perfect timing: I have Thai basil in my herb garden and a new cast iron pan. Can't wait to make use of both. Sounds fantastic! The chicken looks so amazing and the flavors must be so pungent and fragrant…yum! I'm trying this! I'm surrounded by Vietnamese grocers where I live so always have easy access to these ingredients and often make a beef version with green beans and loads of Thai basil (Nua Pad Krapao). Even with all the grocers here I rarely come across the holy basil.I've just discovered your blog and am swooning over your photography! I love Thai but never get around to cooking such dishes at home. Will have to change that. I wish Thai Basil were more accessible though. LOVE the look of this dish. I've never been able to find Thai basil here sadly. This looks fantastic – and easy too! I love the tip about a cast iron pan – thank you! I have a TON of pruple basil as the plant on my windowsill is basically taking over the kitchen. I think I'll try making it with that. Yum! I have to admit that I don't have a cast iron skillet, but this recipe is pushing me to go out and get one. It looks so delicious and flavorful. I love the flavor of Thai chilies, sooo spicy and right up my alley.Though this dish tastes nothing like Pakistani food, it looks so much like a stewed ground beef dish we make in Pakistan called Keema. I did buy a wok and I can use it on the bbq grill for this recipe! which i love by the way! Like the egg thing on top that is fun to do. I totally recommend getting a cast iron skillet. They're about $10 onAmazon and it's one of only 3 or so pans I use on a regular basis (theothers are a dutch oven and non-stick skillet). I use my cast ironskillet to do everything from searing meat, to doing stir fries tomaking naan and tortillas. As for Keema, you're right it does lookpretty similar. It's funny how different cultures have different foodsthat take a common theme. In Japanese food, we have a dish that'scolled Soboro-don that looks very similar to this as well. I have been making this at home for years (minus the egg)~ It's my Go-To “fast food” dish after a busy day. Love it!Your cast iron skillet tip is a good one. I like that this recipe uses staple in my kitchen. This is a great recipe for those busy weeknights. I also typically use a cast iron pan for stir fry, it yields much better results than most other pans. we had this last week and it was great, tasty, fantastic!! wonderfull recipe! My husband & I made this last night & loved it. Thanks for sharing! Absolutely delicious! I've made it twice in the last 4 days – I just can't get enough of the taste so I've taken to doubling all quantities other than the chicken to get a more 'bitty' dish with a bit more sauce too. Hope you don't mind! Keep them coming – I'm onto your pork char sui tomorrow! Thanks! The chilies I use are called “Thai Bird Chili” in the markets here,but I looked it up on wikipedia and the Thai name is “Phrik Khi Nu”. This looks gorgeous. I can’t wait to try it. I’ll be able to pick up some Thai sweet basil in a couple of days, so I’ll give it a go. I love the addition of the egg. I tried this and maybe I messed up, but it was dry and boring. fat that’s on the thighs. Your recipes all look amazing! I finally tried this one as I had most of the ingredients and loved it! I didn’t have Thai basil so I used regular basil (and used quite a lot of it) but the flavor was still wonderful. I made a side of sugar snap peas sautéed with scallion, ginger and added a few drops of sesame oil at the end and it went very well together. Thank you for the great recipe! Say I couldn’t find Thai holy basil, but found Thai holy basil paste…do you know how much of that I could use for this recipe? be better off just using regular fresh basil that the paste. hmmm, well I’ll make it tomorrow. I’ll make a little bit with the paste and see how it turns out, but yeah I’ve got no shortage of regular basil leaves. This only takes about 2-3 minutes to cook if you have all the ingredients lined up. Just prep all the components ahead and keep them in the fridge. If you really want to freeze it, I would just make the recipe to the end then freeze it right away, it should come back just fine in the microwave. I can’t believe this is such a simple dish and easy to make. I was so in love with this dish when I had it in Thailand. Will try to make it soon! I had this dish at my local Thai restaurant. They call it midnight in Thailand. Loved it so much I attempted to replicate it at home. The hard part was coming up with the sauce. I ended up using fish sauce, soy sauce, and garlic chili sauce. Tastes good, but not the same. This dish was one of my favorites when I was travelling in Thailand. I was pleasantly surprised by the authenticism of this recipe! Personally, I would add more chili though! I like it spicy. can i use black pepper instead?? It will taste a little different, but it should be fine. I am a big fan of your blog. I am happy to see that one of your most favorite recipes is for my favorite Thai dish! As a Thai, I am very impressed with how you cook it! IMHO, this is the way to make it tastiest. Super hot wok (to get that smoky flavour-the breath of a wok!) and lots of garlic and chili with minced meat. Keep up the good work! Hi, how many servings is this recipe? any tip on making jasmine rice? ?, im thinking on making you ginger chicken with some jasmine rice. Jasmin rice is cooked just like any other kind of long grain rice. Wash, it then add water, and bring to boil, cover and cook until there’s no water left, turn the heat off and let it steam for 10 minutes. I cook Jasmin-rice to great result by using the method 2-3. First wash the rice, then add 3 parts water to your rice. 2 parts rice and 3 parts water. Bring it to a boil with no lid, then when it starts boiling, lower the heat to very low, let it absorb the water for about 10-15 min, now you can eat it directly, but it gets even better if you let it rest for 10 extra min with no heat.